Contingency fee arrangements are used frequently in personal injury and medical malpractice cases to ensure individuals with limited financial means have their day in court without a large cash outlay. 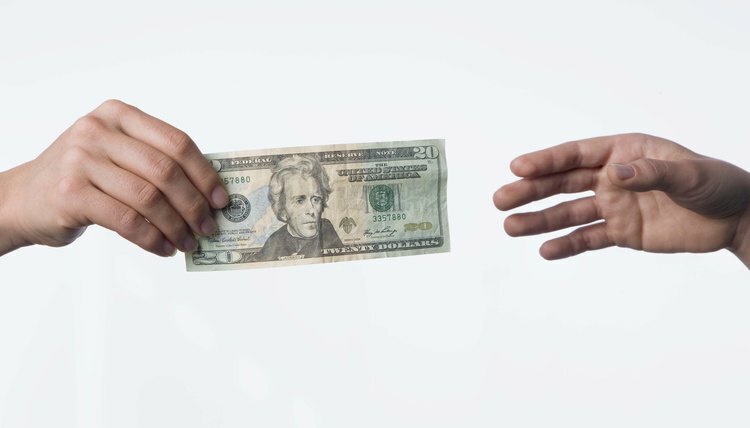 In most states, attorneys in family law cases such as divorces, adoptions, child support and visitation litigation are not allowed to accept contingency fees. A contingency fee is a contractual agreement to pay an attorney with a percentage of the proceeds from the case, if any. Typically, the attorney deducts the cost of court fees, witness fees, copies and other expenses from the settlement or court judgment and then deducts his percentage of the client's net recovery before issuing a check to the client. For example, assume that a case is settled for $50,000; costs and fees total $5,000; and the attorney's contingency fee is 30 percent. The attorney will first deduct $5,000 (case costs and fees) from the gross judgment of $50,000, leaving a net judgment of $45,000. From these funds, the client will receive $31,500 (70% of net recovery) and attorney will receive $13,500 (30% of net recovery). If the client receives no money from the case, the attorney receives no payment. Most states, including California, prohibit attorneys from entering into agreements to handle family law cases on a contingency fee basis. The California State Bar's rule, which is based on the American Bar Association Rules of Professional Conduct, states the fee cannot depend on the outcome of the case. In other words, the attorney cannot be paid a percentage of the child support, alimony or property division in a divorce case. This policy against contingency fees in family law is meant to prevent conflicts of interest between the attorney and client when litigating or settling the case. If a divorcing spouse does not have sufficient funds to retain a lawyer, she may enter into an alternate arrangement known as a family law attorney's real property lien, or FLARPL, if the attorney agrees. The FLARPL attaches the party's interest in the couple's real estate to secure payment of attorney fees for a divorce, legal separation or annulment. The attorney may be paid from the proceeds of the sale of the property, or the client may choose to pay cash from other assets. Unlike a contingency fee arrangement, the attorney's fee is not based on the amount of child support, alimony or other property awarded. If a prospective client has no community property and limited cash, the attorney may be willing to accept a lower hourly fee. She may also agree to accept a smaller retainer than she usually charges and allow the client to make installment payments over the course of the case. Many free legal services do not handle divorces but will assist divorcing couples in handling their own divorces. Some agencies will refer low-income clients to an attorney willing to handle the case pro bono, meaning at no cost, but these situations generally are limited to cases that involve divorce from an abusive spouse or other special circumstances. The legal procedures for obtaining a divorce in your state can be financially and emotionally draining. However, if you hire a divorce attorney to guide you through the process, asking the right questions at the outset can prepare you for what lies ahead. For most people going through a divorce, the essential questions will relate to alimony, child custody, distribution of marital assets and of course, the financial burden of paying your divorce attorney’s fee. What Monetary Percentage Does an Executor of a Will Get in California? California law allows an executor of an estate to receive compensation for his work on the estate. Specifically, the California Probate Code grants a certain percentage of the total assets of the estate to an executor. The percentage an executor may take depends on the total amount of the assets in the estate. Are Legal Fees for Preparing a Will Tax-Deductible? The Internal Revenue Service allows you to deduct attorney’s fees you pay for tax-related work. When the work involves drafting, reviewing or correcting a will, the fees charged may or may not be tax-deductible. It all depends on the nature of the work and how the attorney bills you for it. When in doubt, consult an experienced tax attorney or professional accountant. What Happens in a Divorce When Both Couples Earn the Same?